Disclosure: This garment was purchased by The Lingerie Addict for the purpose of review. All opinions are my own. Marjolaine is one of those lingerie brands I recall seeing in all the high-end lingerie shops, but somehow never got around to trying. When I was only 16, I recall their slips and robes hanging inside Rigby & Peller and being enamored with the artistry of that complex lace appliqué. 70 years later, Marjolaine still appears to be family owned. The French luxury label is based in Lyon and still manufactures all of their designs in France. Their silhouettes come in countless combinations of colour, print and material. Inevitably, all this variety means some of the designs can feel a bit hit or miss. For example, I’m not personally a fan of the brand's use of print, as it often feels a little dated. However, when it gets the designs right, they’re breathtakingly elegant and timeless. Marjolaine specialises in luxury loungewear in silk and French lace. French lace is arguably one of the best laces in the world, usually made on the Leaver’s loom. And it’s expensive. The brand doesn’t just use lace as a fabric, but has become renowned for its use of lace appliqué (a technique where the motifs within the lace design are individually cut out and stitched to another fabric). It’s a technique that can’t be cheated. Appliqué has to be executed by skilled human hands, and is incredibly time consuming. While one can’t buy directly from Marjolaine, the label has stockists worldwide. I purchased this slip from Pleasurements, which still carries several lace appliquéd styles. The ‘Rare’ slip is from Marjolaine’s ‘Gold’ range of more luxurious designs. It was originally 349 euros (approximately $409) and available in sizes XS-L. I purchased the size S/EU 38. My first impression was the slip fit wonderfully with bias cut silk molding beautifully to my shape. When a garment is cut on the bias, it uses the diagonal grain of the fabric which has a little ‘give’ to it. It's not stretch as such, but it means the fabric contours to the body a lot more easily. 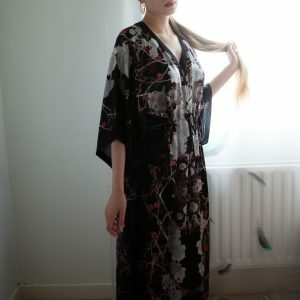 It’s also an expensive cut as it wastes a more fabric and is dramatically more difficult to sew. I was initially worried the size small might be a little tight (based on my experience with other French lingerie brands). However, my fears were unfounded, and it’s a perfect fit. Even if you’re between sizes, there shouldn’t be any need to size up on this particular cut. The slit at the leg left comes up very high. On my 5’7” frame, it reaches all the way up to my hip bone, though people with shorter torsos may find it gives a little more coverage. It’s most definitely a design intended for the boudoir rather than practical underwear for under your clothing (if the sheer paneling over the bust hadn't already made that clear!). The slip is made of a high-quality olive-green silk satin and a black leavers lace. The lace appliqué on this piece is a work of art. 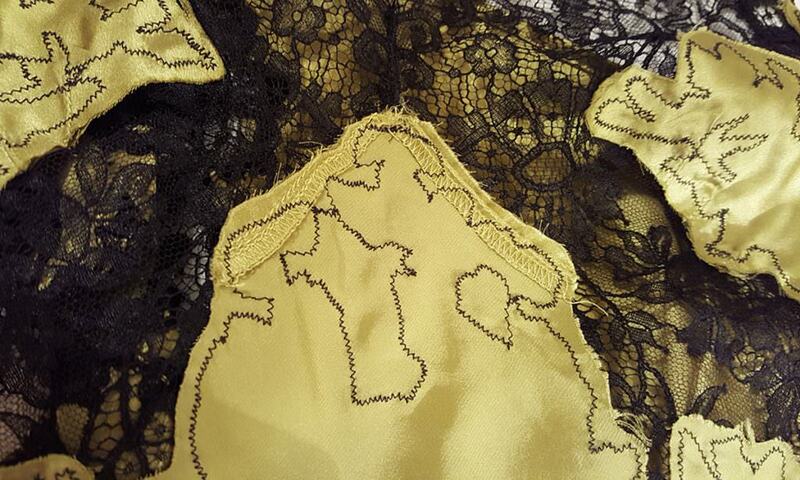 With my design background, I tend to obsess over tiny details in lingerie most people wouldn’t even notice. And this Marjolaine slip has a lot of beautifully executed tiny details. The lace along the neckline is symmetrically pattern matched at the centre front. The motifs at the underarm are not from the original lace pattern, but have been specially cut and appliquéd onto the rest of the lace to seamlessly blend in and follow the contours of the body. This technique of appliqué on top of appliqué is repeated throughout the slip. This garment demonstrates a phenomenal amount of work and consideration. The garment's stitching is high quality and what I would expect at this price point. The slip has French seams (an expensive technique where the raw edges of the fabric are enclosed within the seam) on the sides and back; narrow silk binding along the back edge and shoulder straps; and neat facing along the silk parts of the neckline, giving a crisp and clean finish. The shoulder straps are adjustable with small, gold toned components. 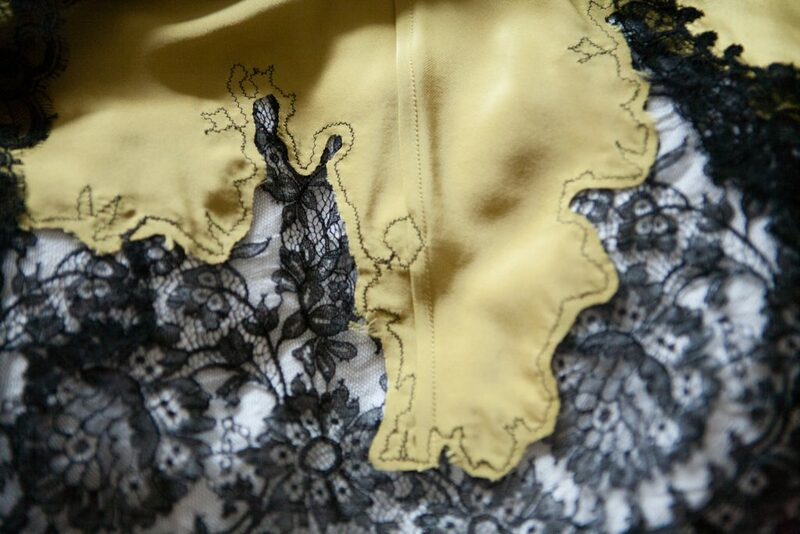 The lace is applied to the garment with a small zigzag stitch, following the contours of each motif. 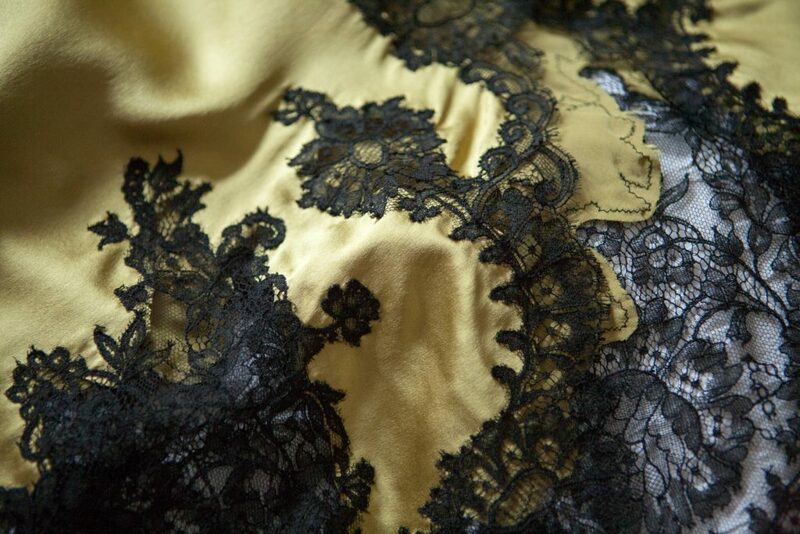 It is barely visible from the exterior of the garment, and blends in to the textures of the lace impeccably. The silk has been cut away behind each motif, leaving these parts of the garment teasingly sheer. Due to the complexity of the lace motifs, this cut away effect requires a lot of time and skill to execute accurately. There are a couple of areas of construction I do wish were a bit more cleanly executed, but honestly, at this price point, I don’t think it’s reasonable to expect anything more. The slip is already an incredibly complex garment with difficult stitch techniques and luxe fabrics. The cutting away of the silk isn’t as neat as it could be, and there are a few areas where it feels particularly messy and is fraying badly. 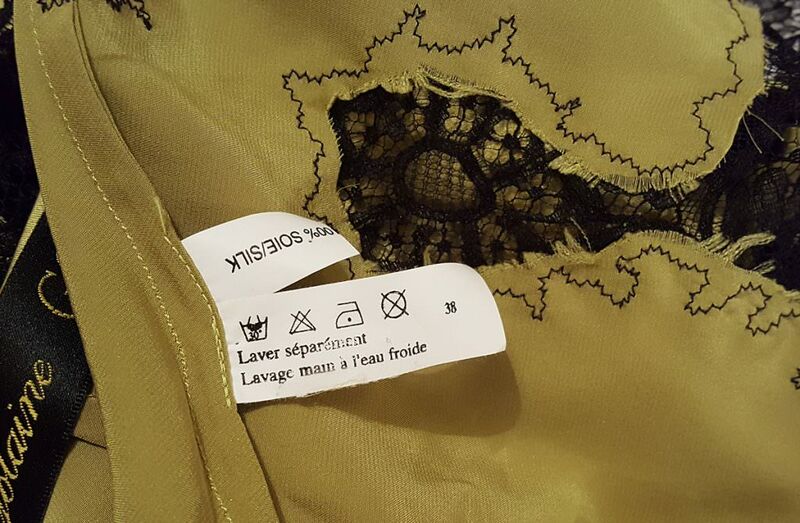 Although the brand name label is delicately stitched in by hand, the care and fabric composition labels are stitched into the side seam by machine without much consideration (one label is upside down and has nearly had some text trimmed off). None of these comments suggest that there’s anything wrong with the garment quality or longevity. They’re simply a few small things I noticed that could possibly be improved to make the slip 100% perfect. That said, those sorts of improvements could raise the price significantly. This slip has given me an overwhelmingly positive opinion of Marjolaine. I can see why this brand has achieved its worldwide acclaim and is such a staple of high-end lingerie boutiques: the product is exquisite. This particular piece is definitely more boudoir focused, but the brand offers so many different silhouettes there will be something for most preferences. 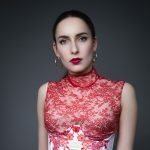 It’s certainly a luxury product with a high price point, but it’s more accessible than other lace appliqué focused designers like Carine Gilson and Rosamosario. I’m hoping this will be the first Marjolaine piece of many in my personal wardrobe. Marjolaine is misleading. It is actually manufactured in China and everyone is told it is made in France. That is why you don’t see any tags on the products saying ‘Made in France’. Wow, this looks lovely on you! I love Marjolaine too. It’s so feminine and makes you feel so beautiful. I own a couple of their night dresses and they never go out of style.